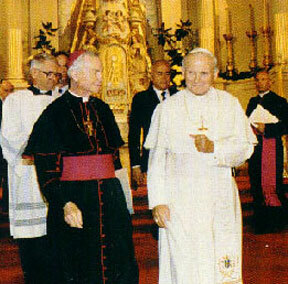 The greatest moment in the history of the St. Louis Cathedral was the visit of Pope John Paul II in September, 1987. 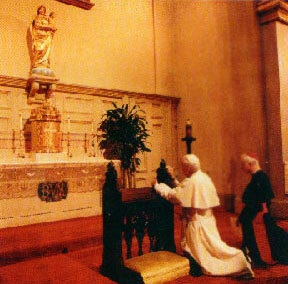 Pope John Paul paused for a prayer before the statue of Our Lady of Prompt Succor, patroness of New Orleans and Louisiana. Many of the more than one thousand priests, sisters and brothers who packed the Cathedral were greeted personally by the Holy Father. The Holy Father also addressed gatherings of youths, educators and black Catholics and celebrated an outdoor Mass for over 200,000 on the New Orleans lakefront.